Below are the meal choices for our annual meeting on April 27th at the Mumma Barn. The price is $12 each and includes a drink. You can pay that day. Please respond by April 25th with your choice so we can get a count. Please email your reservations here. In 2011, the Board of Directors (BOD) of Save Historic Antietam Foundation Inc. (SHAF) established an award for scholarly research regarding the Maryland Campaign of 1862, especially the Battle of Antietam. The award is named in honor of Dr. Joseph L. Harsh, longtime professor at George Mason University, and author of a prize-winning trilogy on the Maryland Campaign. Through the generosity of the family and friends of Dr. Harsh, SHAF is able to provide an annual stipend of up to $2,500 for the successful applicant to undertake a research project to enhance understanding of the campaign and battle. The stipend will be offered annually and will be awarded based on review of the applicant’s proposal by a stipend committee composed of three members of the SHAF Board of Directors, the Harsh family and Antietam National Battlefield (ANB). The committee will also oversee the project. The criteria used to choose an awardee shall be determined by the stipend committee. Unsuccessful applicants may re-apply as often as they like. SHAF hopes this funding will promote research on unresolved issues concerning the campaign, including the experience of the common soldier and civilians, the Maryland Campaign in the larger context of the Civil War, and the remembrance of the campaign and its aftermath. If a scholar does not have a topic in mind, suggestions can be provided by SHAF. The award will be presented to a successful applicant who produces a scholarly paper based on solid, original research with proper citations using the Chicago Manual of Style on some aspect of the Maryland Campaign of 1862. The final paper should be approximately 10,000 words in double-spaced format. Photographic illustrations, maps, and charts are encouraged. It is imperative that the completed project reflect the highest standards of scholarship and research. The award shall be worth up to $2,500. An advance of $1,000 will be paid when the project is approved, the balance upon successful completion of the project. Applicants must submit a 200-word abstract stating the thesis for the research project, a research methodology, and relevance of the topic to furthering understanding of the Maryland Campaign of 1862. They will also provide a brief résumé emphasizing their historical and research credentials. Applications should be submitted by mail to SHAF, P.O. Box 550, Sharpsburg, MD 21782 or by email. Eligibility for the award is open to all persons, except members of the SHAF Board of Directors. Applicants need not be enrolled in any school but must provide evidence of their ability to perform the research required for completion of the project. Monthly progress reports shall be sent to SHAF from the time of selection until the final paper is submitted. The successful applicant shall make a public presentation of his or her findings at the annual battle anniversary commemoration. The full research material, with the presentation and notes, will be submitted to SHAF by December 15, 2019, and will be posted on their website and included in their Annual Report. A copy of all material produced by the recipient shall also be deposited in the ANB Library. The recipient shall also submit a scholarly paper derived from their research to a Civil War or military magazine for publication. SHAF will own the article and receive any publication payment, but the author’s name will be used in the publication. 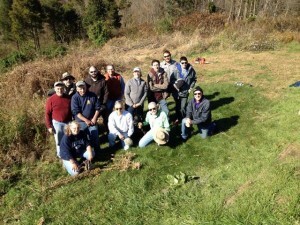 Join SHAF for our next workday at Antietam National Battlefield. We will meet at the battlefield’s visitor center at 9 AM. The visitor center’s address is 5831 Dunker Church Road, Sharpsburg, MD 21782. We will be working on the small farm across from the Antietam Battlefield Visitor Center parking lot. The land is owned by the American Battlefield Trust and we all will need to sign a waiver absolving them of responsibility for any injuries, etc. The tasks will include clearing brush, tree, and fence, so please bring appropriate tools, gloves, and water, and dress for the weather. Chainsaws are permitted, but only experienced users can use them! We will cancel for heavy rain, but will work in light mist or showers. You may park in the Visitor Center lot and walk across the Hagerstown Pike to the site. We will work until noon or 1:00 PM at the latest.